Copyright �1999 Macmillan Publishers Ltd. Further electronic distribution is not allowed. The equatorial oceans are the dominant oceanic source of CO2 to the atmosphere, annually amounting to a net flux of 0.71.5 Pg (1015 g) of carbon, up to 72% of which emanates from the equatorial Pacific Ocean (Houghton et al., 1994; Tans et al., 1990; Takahashi et al., 1997). Limited observations indicate that the size of the equatorial Pacific source is significantly influenced by El Niño events (Feely et al., 1995; Wanninkhof et al., 1996; Murray et al., 1994; Feely et al., 1987; Inoue and Sugimura, 1992; Goyet and Peltzer, 1994; Archer et al., 1996), but the effect has not been well quantified. Here we report spring and autumn multiannual measurements of the partial pressure of CO2 in the surface ocean and atmosphere in the equatorial Pacific region. During the 199194 El Niño period, the derived net annual sea-to-air flux of CO2 was 0.3 Pg C from autumn 1991 to autumn 1992, 0.6 Pg C in 1993, and 0.7 Pg C in 1994. These annual fluxes are 3080% of that of 1996, a non-El-Niño year. The total reduction of the regional sea-to-air CO2 flux during the 199194 El Niño period is estimated to account for up to one-third of the atmospheric anomaly (the difference between the annual and long-term-average increases in global atmospheric CO2 content) observed over the same period. A comprehensive set of atmospheric and surface ocean pCO 2 partial-pressure (p CO2 ) measurements and supporting hydrographic data were obtained during two field seasons in the boreal spring and autumn of 1992, the spring of 1993, the spring and autumn of 1994, and the spring and autumn of 1996. The spring cruises from 1992 to 1994 occurred during the well developed warm El Niño/Southern Oscillation (ENSO) event, and the autumn cruises took place during "cold-tongue" conditions11. The eastern equatorial Pacific Ocean is characterized by high seawater p CO2 and high nutrient concentrations driven by upwelling of the Equatorial Undercurrent. This water mass mixes with a combination of the westward-flowing South Equatorial Current and upwelled subtropical water, which is transported poleward by Ekman divergence along the equator (McPhaden, 1993; Harrison, 1996; Toggweiler and Carson, 1995). As a consequence of these processes, this region is an important site for exchange of carbon between the ocean interior and the atmosphere. Although previous field studies of seawater p CO2 in this region have emphasized the high degree of interannual variability caused by the decline of upwelling during ENSO events (Feely et al., 1995; Wanninkhof et al., 1996; Murray et al., 1994; Feely et al., 1987; Inoue and Sugimura, 1992; Goyet and Peltzer, 1994; Archer et al., 1996), the observations were limited in their spatial and temporal coverage. Our 1996 data set clearly indicates higher p CO2 (seawater p CO2  air p CO2 ) values than 1992 and also that the region covered by positive p CO2 extends farther in both the north-south and east-west directions (Fig. 1). Whereas values close to equilibrium are observed north and south of the Equator in the western part of the study region, the region between 7°N and 6°S has a large positive p CO2 centered on the Equator at 165°E in 1996. In contrast, the data for spring 1992 indicate near-equilibrium p CO2 values in the region of 170°W. Both the seasonal and interannual distributions of seawater p CO2 (p CO2w ) in the eastern Pacific show decreasing trends from east to west, while the largest interannual variability is observed in the eastern Pacific along 95°W and 110°W. Figure 1. CO 2 disequilibria and sea-to-air fluxes in the equatorial Pacific. The distributions of p CO2 (see text) in atm (left) and CO 2 flux in mol m -2 yr -1 (right) in the central and eastern equatorial Pacific are for two field seasons in the boreal spring and autumn of 1992; the spring of 1993; the spring and autumn of 1994; and spring/summer and autumn/winter of 1996. The lower p CO2 values during 199294 ENSO event, combined with lower wind speeds, resulted in a significant decrease in the CO 2 flux compared with the 1996 non-El Niño year. 'Under' atmospheric and surface ocean p CO2 measurements and supporting hydrographic data were obtained during these cruises on board the NOAA Ships Discoverer, Malcolm Baldrige and Ka'imimoana. The 'underway' measurements of CO 2 mixing ratios in dry air were made with a Li-Cor (Model 6251) non-dispersive infrared analyser linked to the shipboard equilibrator following the methods described in ref. 29. The system runs on an hourly cycle during which standards, a headspace sample from the equilibrator, and an ambient air sample are analysed. Standards were obtained from NOAA's Climate Monitoring Diagnostics Laboratory (CMDL) at Boulder. All reference standards undergo a pre- and post-cruise calibration at CMDL against standards certified by the World Meteorological Organization (WMO). Near the Equator there is a general inverse relationship between the p CO2w maximum and temperature minimum (Fig. 2). This is caused by enhanced upwelling and advection of CO2-enriched waters during non-El Niño periods (Feely et al., 1995; Wanninkhof et al., 1996). Sea surface p CO2 is primarily affected by subsurface upwelling processes, which are controlled by local and remotely forced wind events (McPhaden, 1993; Harrison, 1996; Toggweiler and Carson, 1995). When the winds are strongest during the cold cycle of ENSO deep upwelling occurs and p CO2w values are at a maximum (Feely et al., 1995). Figure 2. Time series of p CO2 . The data are from cruises during the boreal spring between 19921994 and 1996 (SST, sea surface temperature). The month of observations is listed in the key. a, Time series along 110°W. b, The p CO2 versus the temperature at the temperature minimum along 110°W. where Sc is the Schmidt number for CO 2 and w 10 is the wind speed at 10 m height in (m s 1 ). We used this relationship for the CO 2 flux calculations. One-month averaged re-analysis wind speeds were acquired from the European Centre for Medium Range Weather Forecasts. Spring flux data show large interannual effects of El Niño on CO 2 exchange in the equatorial Pacific (Fig. 1). From the peak El Niño period during spring of 1992 to the normal conditions in spring of 1996, the average CO 2 fluxes from 10°S to 10°N and 90°W to 140°W increased from approximately 1.2 to 3.1 mol m -2 yr -1 . The increased CO 2 fluxes in 1994 and 1996 are due to increased surface water p CO2 values and higher winds, resulting in stronger upwelling of CO 2 -enriched water from depths of about 70100 m within the upper portion of the Equatorial Undercurrent. Figure 1 also shows a springtime northsouth asymmetry, with the highest fluxes occurring in the southeastern portion of the study area due to the stronger southeasterly winds which enhance localized upwelling. These results indicate that the CO 2 flux to the atmosphere over the region south of the Equator is nearly twice as large as that north of it during spring. The 1992 fall fluxes were also significantly lower in the eastern Pacific as compared with the fall of 1996. Thus, the 199194 ENSO event was a period when the net sea-to-air flux was significantly lower than the non-El Niño period in 1996. The CO 2 fluxes during the 1992 period were very similar to those observed during the peak of the 198687 ENSO event in the equatorial Pacific (Inoue and Sugimura, 1992). But the significant feature of the 199194 ENSO event was that it extended from the autumn of 1991 to the beginning of 1994. Table 1 gives a summary of estimates of annual CO 2 fluxes from the equatorial Pacific for the period 19921994 and 1996 over the regions from 10°S to 10°N and from 80°W to 135°E. For the data from 1992 through 1994, we used the data from this study for the central and eastern Pacific. For the western Pacific we used the p CO2w gradients given in Inoue et al.(1996). The results show that for the 1-year period from the autumn of 1991 until the autumn of 1992, approximately 0.3 Pg C was released to the atmosphere. During the 12-month period of 1993 approximately 0.6 Pg C was released to the atmosphere, in 1994 0.7 Pg C, and in 1996 0.9 Pg C. The total decrease of CO 2 outgassing from the equatorial oceans during the prolonged 199194 El Niño period (that is, 0.81.2 Pg C) was larger than during the severe El Niño of 198283. Table 1. Estimates of the equatorial Pacific sea-air CO 2 flux. 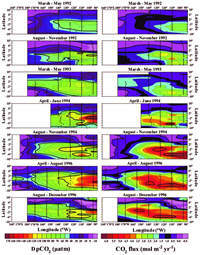 *Equatorial Pacific flux  1996 equatorial Pacific flux. From an analysis of seasonal and interannual datasets. The uncertainties are composed of the seasonal variations of p CO2w (28%), wind speed variability (28%), and the wind-speed dependence of gas exchange (44%). The region of coverage for the equatorial Pacific flux estimates is from 10°S to 10°N and from 80°W to 135°E. ** Difference between measured atmospheric annual CO 2 increase and a long-term average annual increase of 3.18 PgC (ref. 19). Recently, atmospheric chemists have reported a significant decrease in the annual atmospheric growth rate of CO 2 between 1991 and 1993, from a mean value of 1.5 parts per million per year (p.p.m. yr-1) throughout the 1980s to ~0.7 p.p.m. yr-1 in 1992 (Francey et al., 1995; Ciais et al., 1995; Keeling et al., 1995; Ciais et al., 1995). This was followed by normal values during the 19941996 period (average growth rate, 1.65 p.p.m. yr-1). Although all groups have indicated that the slowdown of the atmospheric CO2 growth rate must be the result of an enhanced uptake of CO2 in the oceans and the terrestrial biosphere, there are considerable differences about the role of the oceans in this process. Francey et al. (1995) used atmospheric pCO2 and 13C/12C isotope ratio data to estimate temporal variations of terrestrial and oceanic sinks for CO2 from 1982 through 1992. Compared to earlier years, their 1992 global oceanic sink is about 2 Pg C yr-1 larger than average. Keeling et al. (1995), using a similar global CO2 and isotopic mass balance based on different data sets, found the ocean sink to be 0.6 Pg C yr-1 larger than average in 1992 and 0.9 Pg C yr-1 smaller in 1993. Our data for the equatorial Pacific suggests that this region plays a significant role in the decreased sea-to-air flux of CO2 during an ENSO event. The decreased amount of CO2 released to the atmosphere in the equatorial Pacific during the 199194 El Niño period (that is, 0.81.2 Pg C) was approximately 1636% of the atmospheric anomaly observed over the same period (Table 1). Other oceanic regions could have contributed to the enhanced atmospheric anomaly (Ciais et al., 1995). However, the results of this study represent the largest documented interannual change in the oceanic CO2 source flux observed to date. Model predictions of pCO2 in the equatorial Pacific have suggested a decrease over time because the pCO2a is increasing much faster from anthropogenic inputs than is the pCO2 of the upwelled water (Maier-Reimer and Hasselmann, 1987). This decrease would seem to be reasonable if the main source of the upwelled water is the deep core of the Equatorial Undercurrent which originates in the deep (>300 m) waters of the western South Pacific (Tsuchiya et al., 1990; Toggweiler et al., 1991). The time lag for ventilation of anthropogenic CO2 into the formation waters and its transport to the equatorial Pacific would cause a slower rate of CO2 increase in the upwelled water. However, other models and tracer observations of equatorial upwelling indicate that a significant fraction of the upwelled water is either recycled surface water or entrained water from shallow subtropics north and south of the Equator (Quay and Stuiver, 1983; Gu and Philander, 1997). Under these conditions, surface ocean water pCO2 should have been nearly equilibrated with atmospheric CO2 and increased at nearly the same rate as atmospheric CO2. 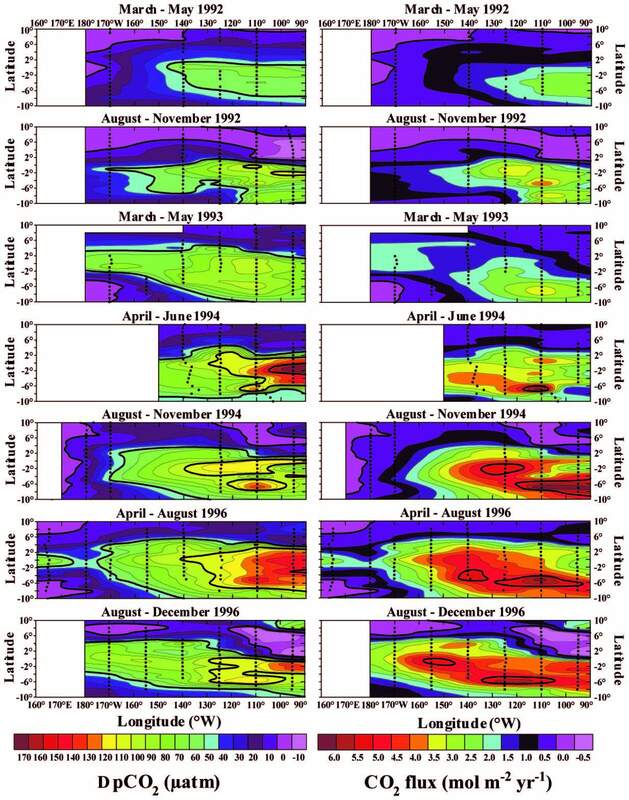 To validate these models, we evaluated seven data sets from the eastern equatorial Pacific collected between 140°W and 160°W in the spring during non-El-Niño years. All data were converted to in situ pCO2 using the equations outlined in Murphy et al. (1994). For each cruise, we constructed a plot of pCO2w versus sea surface temperature for the core of the upwelled water in the region of the temperature minimum near the Equator, nominally between 0.5°N and 0.5°S. We then made a linear extrapolation of the data to a constant temperature of 25°C to remove the effects of solubility changes due to differences in seawater temperature. The results are plotted as a function of time in Fig. 3. The atmospheric data show a rate of increase of about 1.25 atm yr-1 between 1961 and 1996, with a standard error of ±0.06 atm yr-1. The oceanic data also show a similar rate of increase (~1.27 atm yr-1), although the uncertainty is higher (standard error ±0.18 atm yr-1). A similar constancy of pCO2 near 150°W was observed by Goyet and Peltzer (1994) for two cruises in the autumn of 1979 and 1991. As the total range of the pCO2w difference (~50 atm) over the 35-year interval in Fig. 3 exceeds the normal local short-term variations of temperature-corrected pCO2 in this region (Feely et al., 1997), we conclude that the long-term pCO2 increases are due to anthropogenic inputs. For this data set, it appears that pCO2 normalized to 25°C has remained constant at about 100 ± 3 atm over the period of the observations, providing further support for the shallow recycling mechanism. It appears that only a portion of the upwelled water at the surface originates from the core of the Equatorial Undercurent, but that this is sufficient to supply a significant fraction of the nutrient concentrations observed at the surface. Figure 3. Long time series of seawater and atmospheric p CO2 . The region of coverage is the central equatorial Pacific between 140°W and 160°W. The seawater values have been corrected to a constant temperature of 25°C to remove the effect of temperature on CO 2 solubility. Data Sources: 1961, Keeling et al. (1965); 1984, Feely et al. (1987); 1988, Murphy et al. (1994); 1989, Murphy et al. (1994); 1989, Inoue and Sugimura (1992); 1996, Feely et al. (this work). The oceanic increase of pCO2 in the equatorial Pacific agrees reasonably well with other time-series measurements for the subtropical waters. From time-series measurements of pCO2 in the western subtropical Pacific between 3°N and 30°N from 1984 to 1993, Inoue et al. (1995) obtained an average growth rate of 1.2 ± 0.9 atm yr-1. Similarly, the increase with time of oceanic CO2 of approximately 1.5 yr-1 has been observed at the HOT times-series station off Hawaii (Winn et al., 1998). These results support our belief that the entrained subtropical water which is injected into the upwelled water at the Equator has been recently exposed to, and equilibrated with, the atmosphere. Acknowledgements. The assistance of the officers and crew of NOAA ships Discoverer, Malcolm Baldrige, and Ka'imimoana is acknowledged. We thank D.E. Harrison for wind data, and C. Cosca, M. Steckley and D. Ho for the pCO 2 measurements and data reduction. We also thank the NOAA TAO Project Office (director M. McPhaden) for support. This work was supported by the NOAA Climate and Global Change Program as part of the Ocean-Atmosphere Carbon Exchange Study. Correspondence and requests for materials should be addressed to R.A.F. (e-mail: Richard.A.Feely@noaa.gov).